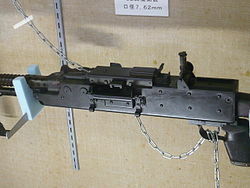 The Sumitomo NTK-62 (62式7.62mm機関銃 Rokuni-shiki Nana-ten-rokuni-miri Kikanjū?) 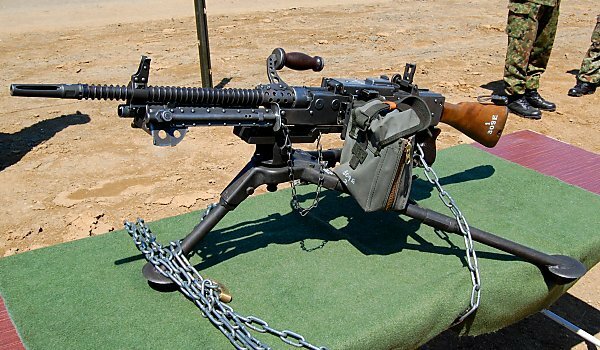 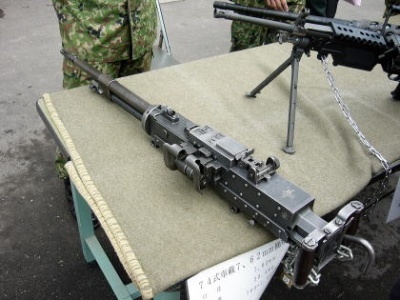 is the standard issue GPMG of the Japan Self-Defense Forces, known as the Type 62 GPMG. 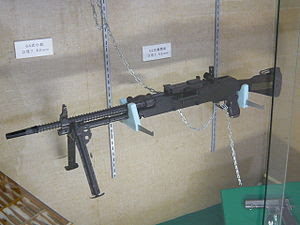 Though the Sumitomo Heavy Industries' M249 had largely replaced it in the J.G.S.D.F,the weapon still plays a support role as it is still used as a co-axial weapon in various armored vehicles, including tanks and APCs, as well as being a medium support machine gun. The Sumitomo NTK-62 is a gas operated machine gun chambered in the 7.62mm NATO cartridge, belt fed with the use of M13 disintegrating links.It has an unusual feed tray as the pivoting lever is above the bolt in the receiver rather than in the feed tray cover found on most machine guns.